1) The considerations for choice of destination in our family are similar regardless of whether it’s a baby or a toddler or both. See Tips for Travelling with babies in previous post. 2) We also tend to look for destinations which have lots of activities for children (farms, parks, playgrounds, theme parks, child friendly restaurants). We have fully come to terms that the days of just walking into a hole-in-the-wall café are over for now and the itineraries have to be super kid centric, with lots of time buffered in between and activities planned around nap times. Toddlers generally do not appreciate scenery unless it comes in the form of a kangaroo running alongside your car, doing somersaults and making funny faces all at the same time, even then I’m doubtful they will be interested for long. 3) For us, it helps if the resort/ hotel/ villa chosen has a kids club, a nice pool that welcome kids and sufficient space in the room for the child to run alittle and not feel claustrophobic. I would feel claustrophobic if I was stuck too long in a small hotel room with my husband and toddler so imagine how trapped that little 90cm child would feel. 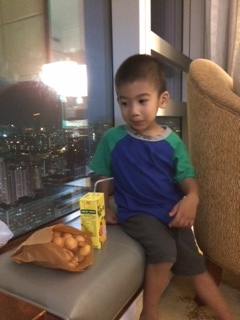 Jah enjoying his roast duck noodles and his gai dan zai (little egglets) in our room in Hong Kong. 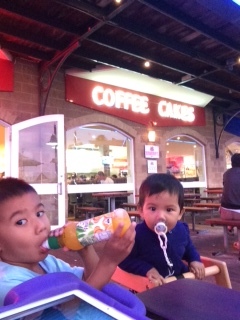 JahBella waiting for their fish & chip at Kaili’s in Perth. 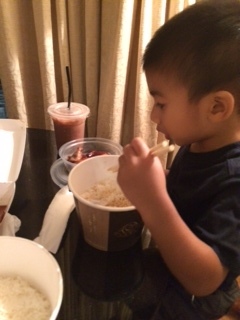 5) Prior to the flight/ holiday, it helps if you preempt the child and get them excited about the trip. Repeatedly talk about the need to buckle their seat belt on the flight. With Jah, we used Barney (an airplane song where Barney sings about kids buckling their seat belts on planes) and the fact that he loves airplanes and is super in awe of pilots, we told him that Uncle Pilot was not going to be happy with him if he didn’t buckle his seat belt. We reminded him almost every day and we also highlighted the flight announcement to him when it was made. 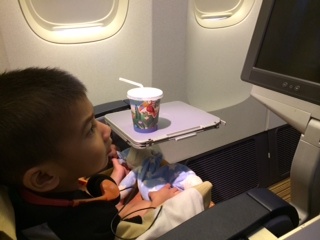 And also that the aunty (aka stewardess) was going to give some a nice meal and toys if he behaved. 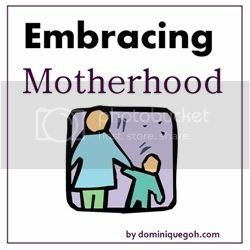 6) Lots of praise (my kid thrives on praises) and likes to feel like an adult so that gets him to cooperate quite abit and lots of peer pressure too. Need I say more? 7) Some parents swear by red-eye flights so that their kids will knock out and everyone gets to sleep. I’m alittle fearful…what if they don’t sleep???? What will happen at 5am when we land and mummy and daddy are sleep deprived? Maybe one day I’ll be forced to go red-eye but until then maybe someone can share some tips on travelling with kids on a red-eye flight. For now we will stick to 7am to 9am departures from Singapore and aim to be back in Singapore by 10pm. This usually means slightly pricier airfares but these timings work for our sanity. 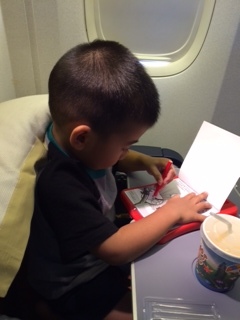 pillow checked, earphone checked, in-flight tv checked, comfort toy checked, art materials checked and most importantly his own drink to feel grown up checked! 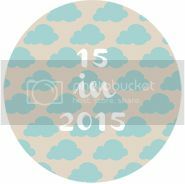 8) Lastly, we have 3 must-have items for our flight with a toddler/ young child. Ok Must-have might be exaggerating it alittle but these 3 items have made our trips a lot easier and a lot more pleasant. The iPad, a pair of Kids safe earphones and the CARES Safety Harness. In fact, I am now contemplating when I will need to intro these 3 items to Bella. More details to come in the next post..